Last edited by Legion on Sun Jan 22, 2012 2:36 am, edited 1 time in total. Sounds great and can't wait to give the board a burl. Can you get the delivery driver to ring me with an ETA, so I can be home to collect board please. Or give me his number and a tracking # and I'll sort it. No worries about passing it on to Sydney, would be great if I could meet up with some of the realsurf crew on a Sat morning for a surf and maybe get some shots. Righto..tracked the board down with TNT. because it is on "road express" it won't be here till next Monday. Bloody 6 days from Yamba to Newcastle, must be going via Perth!! Only gonna be small this weekend anyway, I'll let you know when it arrives Huie. ok its all in your hands ben. Don't worry I gave the manager a huge mouthful . Now they WILL ring me when the get close to delivery. Looks like the swell will be ramping up for the arrival of the board as well...might have turned out for the best. Yep slowy, post up here when it gets to you, just so we know it is still getting round. Who would thunk it so difficult to get a board moving down the coast. Will try to get something going when you are ready to pass it on. Swell next week Slowy, should be able to give it a working over. Lucky Al wrote: You could call your elbows borogoves, and your knees bandersnatches, and go whiffling through the tulgey woods north of narrabeen, burbling as you came. 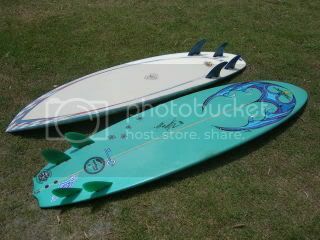 Got the board today (Tuesday) went for a mid morning surf in 1-2 foot offshore waves (beachie). Will hold off most of my opinions till I surf it more. 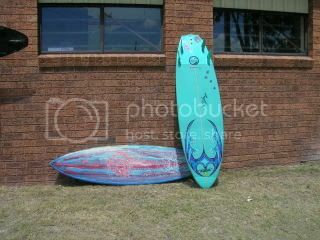 But just initially I was suprised by the bouyancy of such a short board as I usually surf a 6' 4, great to paddle into waves. Also haven't surfed such a short, loose board for ages, remembering that I am nearly 90 kegs and 6'. Felt like I could have done a shove-it "wake-board style" and kept surfin', like there was no drive from the fins?? Juxtaposed to this it was great to "man-handle" the board in the take offs to throw it under me when the beachies were pitching on ankle deep water and trying to throw me..but the board held into the wall and speed off to allow me to make sections I usually wouldn't make..well so consistantly. Keen to get a little more size to give it a chance to open up in some turns and see if it holds a rail. If there is no-one else who whats to have a crack on Huie's CCD in Newcastle or Central coast, I will take the board down Sydney way next weekend, probably Sat morning 31st Oct. Sorry can't PM on the work computer. About the dimensions..yeah too small for me. The surf was only small here at the time, but I had a heap of fun on it regardless. I put this down to the materials. 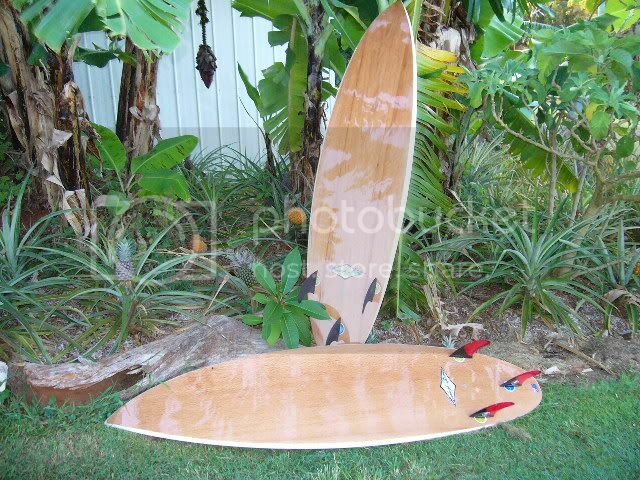 the board floats like fark. Paddling into waves was as easy (if not easier) than my 6'4" PU. Also trimming across flat spots was no prioblems either. So that's about all I can say about the materials..thanks for letting me have a crack on it. I can get down to Sydney this Sat (31st Oct), who is next in line..Oldman still?? Would be good to get a group to meet for a wave at Longy or somewhere. slowy wrote: I can get down to Sydney this Sat (31st Oct), who is next in line..Oldman still?? Let me know what you do Ben and I'll see if I can get up there. If not, there will be someone from these forums to take it off your hands. Righto, the board is heading to Sydney this weekend. Oldman will take it off me (thanks again mate for meeting me ). Hope you get some waves on it. Dissapointed I have to work when I get there as a few piccies and beers would have been good.